Background: Captain of the USS Enterprise 70 years after Kirk's final mission, Picard is the new leader of the Enterprise. 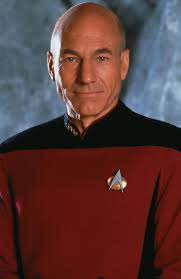 Depicted as deeply moral, highly logical, and intelligent, Picard is a master of diplomacy and debate who resolves seemingly intractable issues between multiple, sometimes implacable parties with a Solomon-like wisdom. Though such resolutions are usually peaceful, Picard is also shown using his remarkable tactical cunning in situations when it is required.